Founded in 2003, Xunlei’s video download and streaming services have been of the most popular in China. And it built a business model based on the user base. The company now must be more willing to position itself as a Cloud-based speed acceleration service provider, with a significantly different revenue structure from that more than two years ago. Xunlei claims it has a total of 300 million monthly active users in March 2014, citing research results by Chinese research company iResearch. Kankan.com, the online video streaming service ran by the company, claimed 136 million monthly unique visitors in March 2014. Xunlei makes revenues from video and download service consumers through paid subscriptions or views, gaming and advertising. Xunlei Accelerator, a Cloud-based speed acceleration service, has become the biggest revenue source to the company since 2013. It offers a free version and paid subscription which has 5.2 million subscribers as of Q1 2014. The accelerator isn’t only for video viewing or downloading experience but also for game players who must be more motivated to pay for better game playing experience. The service charges 15 yuan (less than $3) monthly. 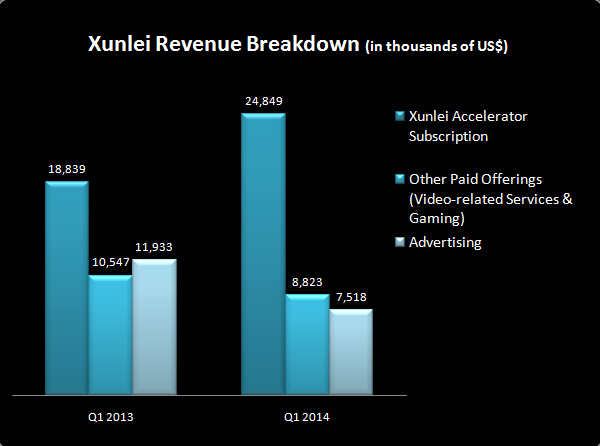 Xunlei is one of the few Chinese Internet companies that makes the majority of revenues through paid subscriptions. Zou Shenglong (aka Sean Zou), CEO of the company, believed membership subscription had been one of the best user-facing monetization approaches in China. The basic services for video download or streaming are for free. For paid services, users can either subscribe to monthly service packages or pay for several hours of video streaming. On Kankan.com, users can opt to subscribe to a monthly package of services, including premium content, ad-free experience, movie/concert ticker deals and a better movie player, for RMB15 (less than $3). According to a report released by Xunlei at the end of 2013, over 90% of the paying users on Kankan.com were male. 70% were aged 25-29 and more than half were college graduates. A pay-per-view-based service, which offers more than 800 premium movies, had 155,000 users as of March 2014. Like many Chinese Internet service providers, Xunlei also offers games to monetize the user base gained through free services. In Q1 2014, gaming made more than twice the revenue than the paid video-related offerings did. 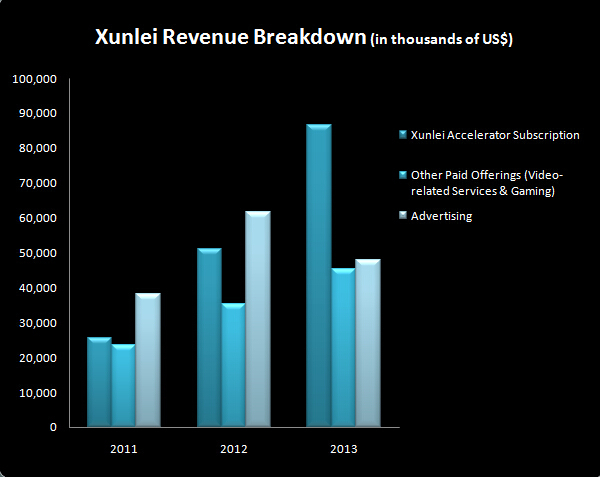 The revenue from Xunlei Accelerator subscription accounts for 60.3% of the total in Q1 2014 while advertising and other paid services, including paid video consumption and gaming, contributed 18.3% and 21.4%, respectively. The first quarter of 2014 actually saw a slight year-over-year decline in total revenue. The growth rate of the total revenues, 27%, in 2013 was much lower than that in 2012, which is 69%. The decelerating revenue growth in 2013 and decline in the first quarter of 2014 is largely due to the decision of discontinuing delivering ads on Xunlei Accelerator which caused 22% decline in advertising revenue in 2013 and 37% in Q1 2014, respectively. Since then ads have been only placed on Kankan.com. The company managed to generate some profits in both 2012 and 2013 while made a net loss in 2011. The company now is trying to reach more users through pre-installs in newly emerged hardware products. The download speed acceleration software has been pre-loaded in 1.55 million set-top boxes as of March 2014. Its video streaming and other services have been integrated into Xiaomi’s hardware products. The company also launched a smart WiFi router earlier this year. Xiaomi, the Chinese mobile device and service provider, now is the largest shareholder, with 27.2% stake, in Xunlei through its venture capital arm Xiaomi Ventures Limited.